From the prestigious Weill Cornell Medical College, you are invited to try Women’s Health Advisor and read some of the most accurate, up-to-date health secrets for women . . .
and learn the surprising health differences between women and men you never knew existed. Read on to find out more about this risk-free offer. You’ve known since grade school that boys and girls are different. But what you didn’t know then, and remarkably medical science is just beginning to discover, is that men and women don’t just look different physically—our bodies actually react differently to diseases, medications, foods, even medical tests and more. For example, some traditional medical tests wrongly classified 98% of women as low risk for having a heart attack. What’s more, even a thorough test like an angiography, where dye is injected into blood vessels to detect blockages, often comes back clear for women who are actually at high risk for heart attack. That’s because unlike men, women tend to have blockages in smaller blood vessels that don’t show up on angiography. Even more astounding, only 1 in 5 doctors know women’s heart attack risks. And heart disease is just one area of medical care where women slip through the cracks. Women with strokes are less likely than men to get lifesaving treatments. High triglyceride levels (bad blood fats) are more dangerous for women than men, but often get overlooked on tests. Women are more likely to experience side effects from medications. Over 50% of all mild heart attacks in women slip past doctors. Diabetes complications may be worse for women than men. The MS symptoms most doctors pass off as “all in your mind”. Medical devices that are only half as effective in women as men. And the list goes on and on. But now you can even your odds and help guarantee your good health simply by trying Women’s Health Advisor! Laughing can be as good for your heart as exercise! With Women’s Health Advisor you’ll know the best test at determining heart disease in women is a calcium score. You’ll discover 7 proven ways to stroke proof your body… You’ll uncover the supplement that drops your LDL (bad cholesterol) up to 25%… And even the exact type of fiber you should eat to reduce belly fat! 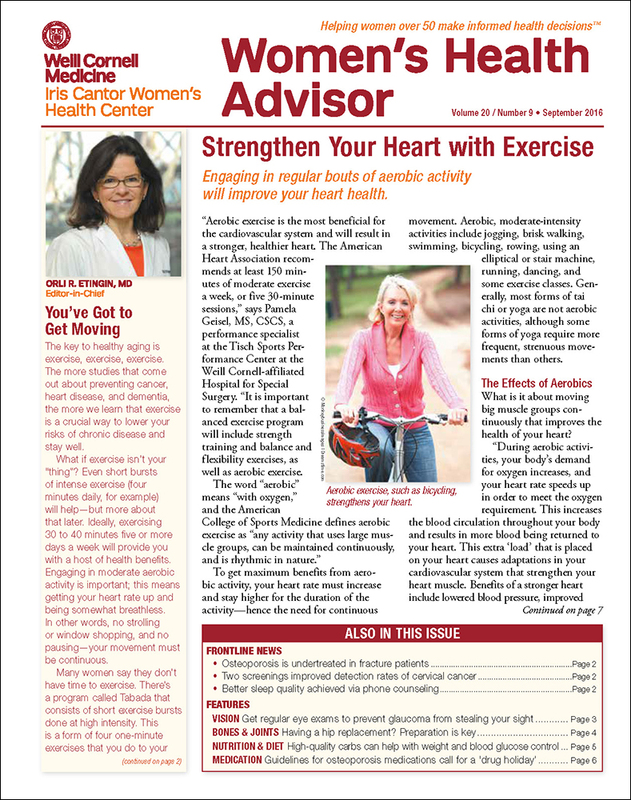 You get the very best in women’s health because for over 10 years Women’s Health Advisor has brought women an accurate, easy-to-read, 8-page newsletter from “The Center for Women’s Healthcare”. This important publication comes to you from the renowned Weill Cornell Medical College (the birthplace of the Pap Smear and many other women’s health milestones) and it’s written specifically for women like you and me. In Women's Health Advisor you'll read about the surprising health differences between women and men you never knew existed! 48 commonly prescribed drugs that either don’t work or aren’t worth the risks! Most women can reverse memory loss by doing this! Slash your chance of dying from cancer by 49% with relaxing meditation. Secret to melting deadly abdominal fat. Natural way to relieve knee pain that works better than expensive prescriptions! The bone-building vitamin nearly every woman over 50 doesn’t get enough of. Even a breast cancer drug some experts are calling a cure! Even just a little exercise can make you younger! Believe it or not, by taking part in an exercise program you can increase your aerobic fitness by 10-15%—and our study shows that’s like being 10-20 years younger! You can count on every issue, every article for scientifically proven, trustworthy information. Women’s Health Advisor accepts no advertising whatsoever, so we’re free to tell you the truth about prescriptions, OTCs, natural remedies and much more. In fact, a recent issue warned women about these prescription backfires! Evista—a common osteoporosis drug – does indeed reduce fractures and it even lowered risk of breast cancer, but it also increased women’s risk of blood clots by 44%! We told women how to tell if this drug is right for them. A common blood pressure drug that increases risk for stroke. Better than Celebrex! Get osteoarthritis relief without the harmful side effects. The drug that cancels out aspirin’s heart healthy benefits! Current vitamin D levels actually have no beneficial value. In order to protect your bones and block fractures you’ll probably need to take at least 1000 IUs a day. And for the elderly it may even be as high as 4000 IU. And vitamin D could protect against obesity… colon and breast cancer and even help fight autoimmune disorders like MS, rheumatoid arthritis and type 1 diabetes. You not only get the best in medical breakthroughs, prescriptions and natural remedies, but we’ll bring you the best in food and nutrition for women too, like . . .
A spice that actually stopped the spread of breast cancer cells in tests . . . and boosted the effectiveness of chemotherapy drugs. Why women over 50 should ignore the RDA for vitamin D and actually take much more instead! The supplements you need to fight age-related macular degeneration! The fruit you need to cook to release its cancer protecting power. Make your brain 3-4 years younger with this yummy fish! Drink up! Just 2 cups of tea a day may help protect you from ovarian cancer. How low-fat dairy foods may help you lower your blood pressure without drugs. Use wine to boost your memory and lower your risk of broken bones! Thanks to the antioxidant and anticlotting powers of alcohol, light to moderate consumption may improve your memory, decrease risk of dementia, and even increase bone mineral density! Cheers! Best drug for older women with breast cancer. Clinical trials prove it increases your chance of disease-free survival. Effective ways to manage menopause without hormone therapy. How to protect yourself from symptomless cancers that attack women! The single drug that reduces the risk of stroke by up to 60% for women with atrial fibrillation. How to sail through the most common orthopedic procedures for women over 50! 3 most important questions to ask your doctor—even if you’re feeling great right now. ”Diabesity” – the new disease of postmenopausal women. Here’s how to tell if you’re at risk—and what you can do to stop it now! Arthritis Relief without Prescription Side-Effects! Despite some negative articles on glucosamine and chondroitin our experts say that you can get real relief from osteoarthritis by taking 1500 mg a day of glucosamine sulfate, and 1200 mg of chondroitin taken in 3 separate doses. You may even get more relief with a supplement like Zingerflex that has 510 mg of ginger. Why you’re wasting your money with antiaging spa creams and facials. For real wrinkle reducing power try chemical peels! Easy ways to escape the sting of urinary tract infections. Best alternative therapies for arthritis. How to zap fibroids without surgery. Most effective ways to screen for breast cancer in high risk women. Mammograms alone simply won’t do the job. How splitting Zocor tablets saves you a bundle of cash—and brings you the same cholesterol lowering benefits as a whole tablet. Women’s Health Advisor will help you steer clear of unnecessary surgeries, low-quality medical tests, side-effect laden prescriptions and more that can put your good health at risk. Get Big Health Benefits with YOGA! Yoga is more than just stretching—research is now proving that even while sitting down you can lower your risk of heart disease and diabetes. And amazingly yoga can help fight everything from back pain to asthma, and even help you lose weight! Every month you’ll get columns like Frontline (with the latest health breakthroughs), Cardiac Health, Prevention, Solutions, Nutrition News, and even the most important findings to come from the Society for Women’s Health Research and more. And of course our reader’s favorite feature, “Ask Dr. Etingin” where Orli Etingin, MD, the director of the Iris Cantor Women’s Health Center and Professor of Clinical Medicine at Weill Cornell Medical College answers your most pressing questions. Plus you’ll find powerful help in “What You Can Do” boxes that give you a checklist of the steps you can take to prevent, treat and even cure diseases. I’d like to send you the next year of Women’s Health Advisor with a 100% money-back guarantee. Why? Because there are some things that are more important than money, and your good health is one. So send for your first issue today and uncover health secrets like how lasers are being used to make varicose veins shrivel up and disappear… Regain the 20/20 vision of your youth! …A “lunch-hour” face lift that’s done right in your doctor’s office… Permanent contact lenses that correct nearsightedness without the risk of laser surgery (works for 92% of patients!) and much more. To start your risk-free subscription, click here. If you are ever dissatisfied with your Women’s Health Advisor subscription, write, email or call and a full refund will be issued without question.